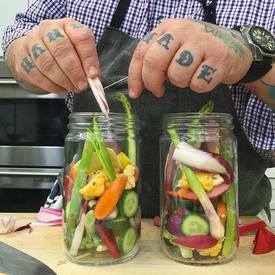 Preserve the season's best produce with Boston chef Matt Jennings' fool-proof pickles. “Feel free to make this recipe your own,” says Jennings. “Play with seasonal variations: ramps and green garlic in the spring, or chicories and root vegetables in the fall and winter. Aim for using a variety - that way the pickles are visually stunning and look great in the jars.” Once you get the hang of this method, you can pickle to your heart’s content all year long.